A Walk to the Museums: From Palais de Tokyo to Palais de Chaillot. 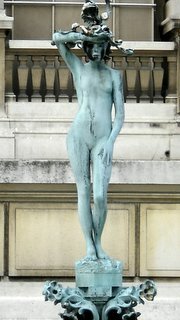 This walk in Paris begins at the Metro station Alma-Marceau, on line #9. 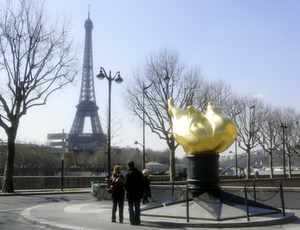 By exiting the station in the direction of Pont de l'Alma, you will come out directly in front of an exact replica of the Torch of the Statue of Liberty. This Torch has become a place of homage for Princess Diana, whose fateful car accident occured in the underpass just below the Torch. Often, flowers are left here by mourners. From the Torch, retrace your steps back to the metro station and continue up Avenue Marceau to the first corner, which is Avenue de President Wilson. Turn left here (west). The parkway in the middle of this avenue fills with booths twice a week for an open-air market. On Wednesday and Saturday mornings, from 8 a.m. to 12:30 p.m., one can shop for fresh vegetables and flowers, meats and fish, cheeses and wines as well as clothing, books and housewares. Not far from having turned on to Avenue de President Wilson you will come to, on the left (south) side of the street, the double buildings of the Palais de Tokyo which houses the Musée d'Art Moderne de la Ville de Paris and the Site de Creation Contemporaine. There is also a restaurant, a cafeteria and a bookstore here. The Site de Creation Contemporaine is open from 12 p.m.-12 a.m. everyday, except Monday. Admission is 6 euros for adults, and 4.50 euros for students and free for those under 18 years of age. Pass through the archway between the two buildings and down the steps. You will come to a marbled plaza with a large pool. On week-ends, this plaza is a skate-boarder hang-out. 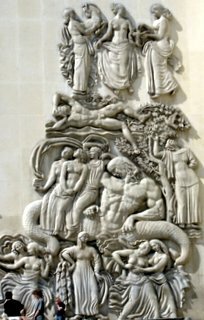 The main reason to walk down here (unless, of course, you've brought your skate-board) is to see the intricate sculpture in bas-relief along the wall of the stairs you just walked down. These sculptures were created by Alfred Janniot. Above this wall of sculptures is a tall bronze statue of a woman holding an upright spear. 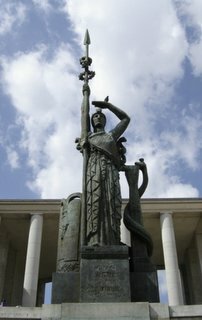 This statue is dedicated to the volunteer forces of the Free French who died for the honor and liberty of France, June 18,1940 - May 8,1945. The statue is called "La France" and it is the work of Antoine Bourdelle. The statue was created in 1925 and placed here in 1948. Across Avenue de President Wilson, opposite the Palais de Tokyo, is the gated entrance to the garden of the Palais Galliera. This garden has been recently renovated. In the center of it is a lovely fountain and statue of a pixie. Also in this garden is a bronze sculpture, created by Perraud in 1858, of a cherub irritating a tolerant god. Also can be found is a marbled sculpture of a powerful man in an animal skin, holding, in protection, a young child, who is happily reading. The Palais Galliera houses the Musée de la Mode, the Museum of Style. The entrance to the museum is on the other side of the building from the garden. From Avenue de President Wilson, on the right side of the garden (east) walk up Rue de Galliera and around the fenced perimeter of the garden to Avenue Pierre 1er de Serbie. Here you will easily find the beautiful arched entrance to the museum. From the Palais Galliera, walk left (west) down Avenue Pierre 1er de Serbie and you will shortly arrive at the Place d'Iéna. In the middle of this Place is a bronze statue of General George Washington, on horseback. Located here is the Metro station Iéna, on line #9. On the north side (right) of Place d'Iéna is the Musée Guimet,a museum of Asian Art. The Guimet Museum has been recently renovated. On the west side of Place d'Iéna are the large buildings of the Conseil Economique et Social and the Union de l'Europe Occidental. These are among the few buildings in Paris made completely of concrete. Continuing west on Avenue de President Wilson, which passes through Place d'Iéna, you will arrive at Place du Trocadéro et du 11 Novembre. 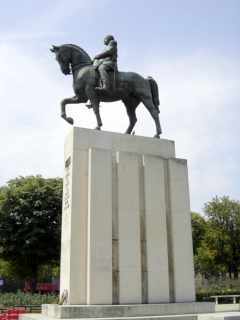 In the middle of the Place is a statue of Ferdinand Foch (1851-1929), the Supreme Commander of the Allies during World War I. The impressive double buildings, on the east side of the Place du Trocadéro, is the Palais de Chaillot. 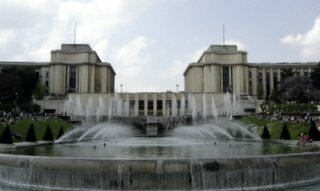 The building on the north houses the Théâtre Nationale de Chaillot. The building on the south contains the Musée de l'Homme (Museum of Mankind) and the Musée de la Marine(Maritime Museum). One must take some time here to enjoy the view offered of the gardens, the statues, the elaborate fountains and large pools, the Seine river, and, not to mention, the world-class view of the Eiffel Tower and the Parc du Champ de Mars. The Musée de l'Homme is open everyday, except on Tuesday and holidays, from 10:00 a.m.-5:00 p.m. on weekdays and from 10 a.m.-6:00 p.m. on week-ends. Admission is 7 euros for adults and 5 euros for students and seniors, free for those under 4 years of age and for handicapped persons. The Musée de la Marine is open everyday, except on Tuesday and holidays. The hours are from 10 a.m.-6 p.m., with the last entry at 5:15 p.m. Admission is 8 euros for adults, 6 euros for students and seniors, 4 euros for ages 6-18 and free for those under 6 years of age. At the Place de Trocadéro is found the metro station Trocadero and lines #9 and #6.